Whether you’re an operator moving into a showfile that another programmer built, or maybe you’re covering for someone else on their show…. 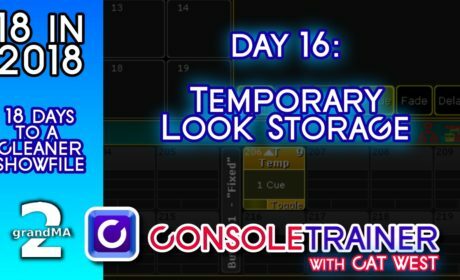 there will come times when you need to move into someone else’s show file: like today, where we move you into the Consoletrainer showfile that we downloaded yesterday. 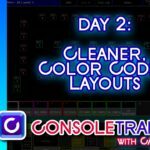 (If you don’t have it, you can grab it off consoletrainer.com) Since there’s so many options on how to set these consoles up, everyone does it differently. You’re probably thinking that the first thing you want to do is to load your user profile, but I’m going to suggest that you not. We’re going to make a copy of the previous user’s profile and just update it to suit our needs. Here’s a couple of reasons why: First, every show is unique and has unique needs. The previous programmer probably already dealt with those and built some views and changed settings to meet the needs of the show you’re moving into. Those are invaluable! Second, I find that in trying out other programmer’s setups, I’ll inevitably pick up some new way to do something that I hadn’t thought of before. Most importantly, making a copy preserves the previous programmer’s profile, so it will be intact when they return. 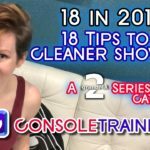 Before we do anything, lets make a backup file and call it “consoletrainer2018 Jan 1”, or feel free to annotate it as Day One, or tip title- whatever works for you. Even though the console notes the date and time of the backup, I make it a habit to include the date in the title of my showfile for easier location later on. This is the first thing I do each day, so I’m working in the correct file. Press SETUP, click on USER PROFILES. While we’re here, if you see a LOT of profiles that aren’t in use, now is a good time to delete them- start by deleting the unused profiles, then the unused users. They waste a lot of space. This only has a couple, so we’re good. The user we’re currently logged into is “trainer” and the profile is “consoletrainer.” I want to copy the profile first, so I’ll click on it and then click “Copy Profile.” Then we’ll click “New” and select “Paste Profile.” Now it’s an exact copy- go ahead and rename it by right clicking or encoder clicking on it and giving it the name of your choice. Now, up in User Profiles, right click on “New User”, give it the login name of your choice, and then in the profile column, right click and select your new profile that we just created to attach to it. Keep in mind that the name that you just gave your User is what you will use to login, so make it easy to remember. Close this window and hit the TOOLS key and login with the name of the User that you just created. Now you have an exact copy of the profile I was using in these tutorials. At this point, you can change settings or views to match your needs. The other thing I make sure to do when I’m moving in is to bring in my favorite macros and effects. I keep these files with me on my thumb drives so they’re always ready to go. 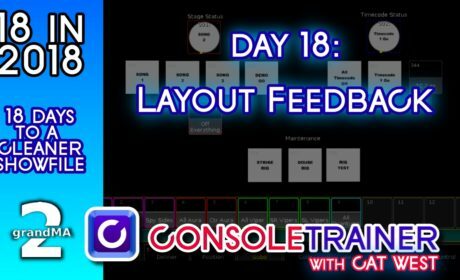 If you’ve got another showfile that has your preferred macros and effects, feel free to load that showfile now so that you can export your own, and then import it into our “consoletrainer” showfile. If not, no worries, stay here and we’ll use what’s already in this showfile as an example. 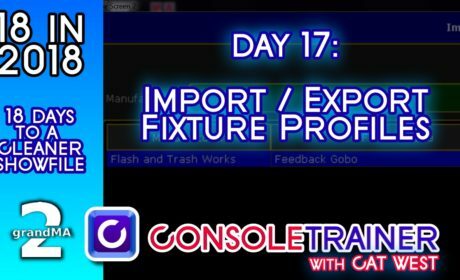 Press SETUP and select Import/Export. Make sure your thumb drive is connected to your console or PC. Just like with the showfile, this information will need to be saved in the correct folder in the MA file system, and the console will know where to put it. We’ll start with importing macros, since this file currently doesn’t really have any. Click on “Import”, select “Macros”. You’ll see a predefined.xml file that will be available to you at any time. It’s a very long list. You can pick and choose, but for this example, I’m going to click and drag down to select all of them. It says “Start at Macro” with the number 2. Thats because, thats my next open spot in the macro pool. You can change this to be any number you wish. You might want to check your macro pool to see where you have the free space to put these before you import. Number 2 is good for me, so I’ll make sure “Confirm” is selected and I’ll click “Import.” It says they’re in there, 232 macros, (holy crap)… I’ll check the Macro Pool and there they are. Now we’ll use some of the effects I created for other training videos to show you how to export. If you look at screen 3 or 4, there’s a view called “FX Show.” Click on it and you can see that the effects from the other tutorials start here at number 128. And, they include these blank blocks that I use as organization. If this is something new to you, check out my video on Organizing Effects. We’ll go back to our Import Export options by clicking SETUP, then “Import/Export”, click “Export” and select “Effects.” In this new window, first make sure to select your thumb drive so that we export to the right place. Now, on the left side of the screen is a list of all the effects currently in your show file. The first chunk I have here are all of the predefined effects. My effects start at number 128, so I want to select those. We’ll click “Export”, give it a name and then we’re done. We can now import those to any other show file. The importing process for effects works just like what we did with the macros, so feel free to give it a try.